Okay now, do I really need to summarize the movie Jaws? Doesn't everyone in the world already know about this film? Yeah, I'm pretty sure, but I suppose for that one lone plane crash survivor who was taken in and raised by wolves and only recently found and brought back to civilization, I will go ahead and provide a brief summary. Police Chief Brody is a new resident to a small island town that survives on summer dollars. Unfortunately for Brody and the town, there appears to be a great white shark prowling the waters. People are turning up dead, but it's not until the death of a little boy amongst a crowd of beach goers does the mayor take the threat seriously... or at least semi-seriously. Now Brody, along with shark expert Hooper and shark hunter Quint, must head out to sea and face down this rouge great white in order to make the beaches safe once again. Okay, now I know that you're probably thinking "wait a minute, wasn't there a 25th anniversary edition just released"? Yep, sure was, and the only difference between this 30th anniversary DVD release and the previous 25th anniversary DVD release is more extras. The movie itself hasn't been changed at all, at that's definitely a good thing, because the movie was, is, and always will be awesome. So thank you, Steven Spielberg, for not adding in 20 minutes of new footage or re-doing the shark with CG. It's great the way it is, and it should always stay that way. The packaging of this edition makes it look like some kind of box set, but it's really just two DVDs in one plastic DVD case packed alongside a 60 page photo journal with scenes and quotes from the movie. This was fun to look through, and I would read off quotes to my wife to see if she remembered who said them (since she's a huge Jaws fan). Of course she got most of them right. The two discs are both single-sided, which I'm really glad they did. Besides not needing to break out the magnifying glass in order to tell which side of the disc I'm looking at, Jaws discs just simply deserve to have artwork on them. The first disc contains the movie, along with some deleted scenes and an outtake reel. The second disc contains production stills, storyboards, some other static things you navigate through with your remote's directional pad (or slideshow if you're lazy), and a two hour long documentary about the making of the movie that is quite entertaining indeed... did I just say "indeed"? Anyway, the documentary covers all the aspects of the film, like casting and hiring the actors, going from the novel to the final script, creating the mechanical shark, filming on the ocean, and so on. I don't think they missed covering anything here, and it was all very interesting to hear about. I didn't doze off once. This isn't your standard director and key actors documentary here. They got interviews and insights from a whole bunch of people actors who worked on the film, which helped to keep it fresh so you didn't keep hearing from the same four people over and over. Besides Speilberg and the principle actors, they had people who worked on the special effects and people who filmed the live shark footage and just a whole lot of other people involved with the production and music and all that. Besides just finding out little facts and tidbits about the movie, we are also treated to the occasional anecdote about something that happened on set or during production. All in all, it really was one of the best documentaries I've seen. Okay, now back to the first disc. As I said, this movie is great. The deleted scenes, however, were not so great, thus the reason they became deleted scenes instead of appearing in the final film. Wise choices there, guys. The outtakes reel was kind of funny, but not really anything special, and nothing I haven't seen before on the 25th anniversary edition. So what exactly is the difference between the 30th anniversary release and the 25th anniversary release? Well, the main difference is the inclusion of the two hour documentary, which was apparently made for the 20th anniversary laserdisc release. The 25th anniversary release had an edited version of this documentary which was only an hour long. There are also some additional deleted scenes, big whoop there, some additional stills, and then that 60 page booklet I mentioned. So this is a pretty good anniversary addition, and I'd recommend anyone who doesn't already own Jaws on DVD to grab this. If, however, you've already shelled out your dough for the 25th anniversary release, then just hang on to that one and pass this collection right on by. 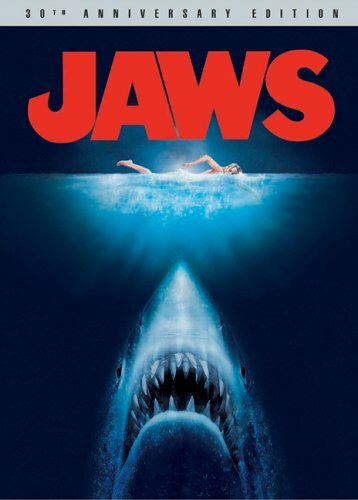 Jaws - 30th Anniversary Edition is being released by Universal Home Video on DVD starting June 7, 2005. It was directed by Steven Spielberg, and stars Roy Scheider as Police Chief Martin Brody, Robert Shaw as Quint, Richard Dreyfuss as Matt Hooper, Lorraine Gary as Ellen Brody, and Murray Hamilton as Mayor Larry Vaughn. For more info and clips, be sure to check out the official website for Jaws - 30th Anniversary Edition.